The last six years have been a great time to be a Macross gamer. There have been three full PSP titles and an additional three short PS3 games as Blu-ray extras as well. And now, thanks to the success of these six games comes the franchise's first full PS3 game, Macross 30. While the Macross games mentioned above focused on taking you through the story of each anime in the franchise mission by mission, Macross 30 instead follows a completely original plot. Leon, a fighter pilot crash lands and finds himself trapped on the planet Ouroboros—which is pretty much the equivalent of the Bermuda Triangle in space. But on the planet, he finds he is far from alone as many others from across time and space have been stranded on the planet as well. Thus it's up to him, his ally Aisha, and the mysterious girl Mina, to unlock the secret of the ruins that cover the planet. 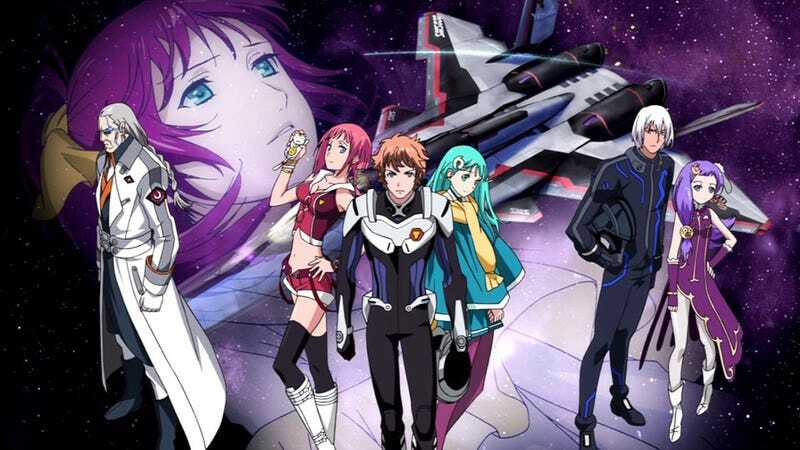 It is an interesting story filled with deep original characters and a mystery that ties into the very core of Macross lore. from all five Macross series return in Macross 30. The best selling point for the game is seeing how the characters from across the franchise interact with each other. But what's really unbelievable in a project like this with so many famous characters is the amount of voice acting present in the game. Every main story mission is fully voiced and contains a large amount of banter not only between the new characters but also between the classic characters. All (living) voice actors return to voice their characters and deliver tons of original dialogue. It's pure fan service at its finest. Good — A "Flight Action RPG"
missions. And instead of unlocking new planes based on a grade or score, you now loot the wrecks of your enemies for parts and—once you find the blueprint—use them to build yourself a better model of plane. Each town includes a shop and a "hunter's guild" where you can gather side quests. Sometimes these are optional boss battles. Other times they are collection missions in dungeons you have previously cleared in the course of the story. There are even several flying races and timed obstacle courses to play around with. And while none of them really live up to the level of the main plot, they still give you plenty to do while gathering parts for your next plane. When it comes down to it, Macross 30 has two major problems: uneven difficulty and an easily exploitable AI. Here's an example of both. Scattered around the various world maps of Macross 30 are many capital ships, usually poised to attack one of the world's villages. These ships have a ridiculous amount of HP, spawn unlimited waves of enemy fighters, and have weapons that are capable of killing you in a single shot. Taking one down can easily take 5 to 10 minutes even if you don't make a single mistake. And since dying sends you back to the last time you left your ship (or started/completed a mission), fighting these ships can be a painful time sink. …Or you could abuse the hell out of the game's programming and exploit the fact that your gun's range is better than the capital ship's. Moreover, most of the ship's fighters won't even notice you at that range, and if they do, your wingman will automatically draw their attention. So hover at max range, tape down your fire button, and make a sandwich. When you return, you'll have liberated a town. Macross 30 is a celebration of all things Macross. The original story and massive voice cast make it a joy for any fan of the series. The gameplay is generally fun and addictive, and though there are some frustrating rough patches, they don't do much to dampen the experience. It is an improvement over the past six Macross games in every possible way and is quite simply the best Macross game made to date. A word for potential importers, though. Unless you speak Japanese, the vast amount of what makes this game enjoyable—namely the interactions between the characters from across the franchise—will be lost on you. But if you find you are dying to fly a transforming plane all on your own despite the language difficulties, you may still find something to love in Macross 30.